About £3 million was spent on policing the controversial Orange Order Whiterock parade in Belfast which descended into violence, it has been confirmed. Another £938,000 was spent on repairing police vehicles damaged during disturbances on the streets of Ireland's north this summer, the PSNI said. In a statement responding to SDLP claims that the Whiterock parade had cost the police £2.2 million, the police also said that between September 10 and 17 in the wake of the Whiterock parade, 82 people were arrested and 12 weapons recovered. A total of 93 police officers were injured. PSNI Chief Constable Sir Hugh Orde said: "The events of the weekend of September 10 were unprecedented. "My officers, as I have said before, acted like heroes in the face of the worst public disorder this police service has ever witnessed. "The costs are unacceptable, not only in financial terms but more importantly the human cost both to the police service and local communities. Ninety-three police officers were injured as a result of the disorder." SDLP councillor Tim Attwood said the sums announced by the police amounted to a shocking waste of public money. "The violence that followed the Whiterock parade made no sense and only damaged community relations," he said. "Now these figures highlight the staggering cost to the taxpayers of policing parades in Northern Ireland. This money could be far better spent on essential public services. "£3 million could pay for 119 additional nurses. It could pay for improved schools or more police on the ground tackling local crime. "£3 million is the cost of only one parade. Compare it to the £1.5 million in additional money pledged to victims groups by the British Government last week. "Furthermore we also know that the repair bill for police vehicles damaged in the rioting the entire summer was over £900,000. "What was the cost of the policing operations around other parades? What was the cost of the entire summer?" Mr Attword raises some very important points. The disgraceful behaviour of the Orange Order and the loyalist thugs during the Whiterock parade has hit the decent men and women of the North in the pocket. Is this all the unionist community has to offer? Violence, mayhem and then to top it off, hurting the decent folks of Ireland's north financially? If so, let us instead look forward to a brighter future. One without partition, one without violence and anarchy, one in which the people throughout the island of Ireland can work together to give future generations of Ireland a country they can really be proud of. 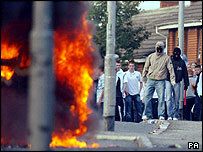 The violence which has plagued Ireland's north for decades has been too costly. We need to instead work towards a United Ireland that all people on the island can believe in and feel proud of. Such an Ireland would truly be priceless. For us, and for future generations. United Irelander gets sexed up!